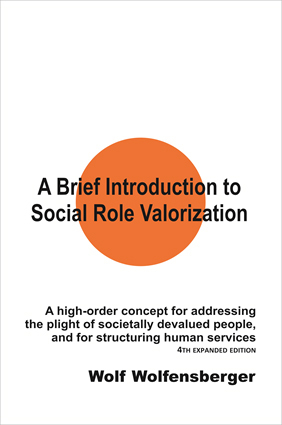 This book explains the human service approach of Social Role Valorization or SRV. “…in order for people to be treated well by others, it is very important that they be seen as occupying valued roles, because otherwise, things are apt to go ill with them. Further, the greater the number of valued roles a person, group or class occupies, or the more valued the roles that such a party occupies, the more likely it is that the party will be accorded those good things of life that others are in a position to accord, or to withhold. Accordingly, the most recent formal definition of SRV is “the application of what science has to tell us about the defense or upgrading of the socially-perceived value of people’s roles.” Another way to put it is that SRV is a systematic effort to extract empirical knowledge that can be applied in service of the valuation of people’s roles, so that they are more likely to have access to the good life, or the good things of life.” (p. 81). This version has been expanded from the third (1998) edition of 139 pages to 275 pages. World renowned human service reformer, Professor Wolfensberger (Syracuse University) was involved in the development and dissemination of the principle of normalization, and originated the program evaluation tools PASS and PASSING, and a number of service approaches that include SRV and Citizen Advocacy.